Yoghurt is one of those confusing foods. You want your children to be eating it and getting in their calcium, but so often yoghurts can be laden with sugar. Personally I encourage my children to eat yoghurt daily, it is our go-to dessert after our evening meal. To help you, I’ve come up with a ranking of children’s yoghurts and give my verdict on those to have in the fridge everyday and those to leave for occasional consumption. Why the confusion? Well firstly the choice is overwhelming. Walk down the yoghurt aisle and you are bombarded with brands, health claims, cartoon characters, pots, tubs, pouches. What should you choose and how do you know? Let’s talk about sugar. 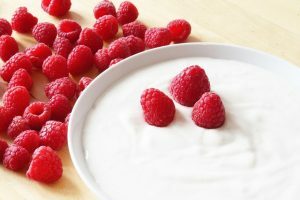 Yoghurt contains lactose which is a naturally occuring sugar and not one children need to cut down on. However you cannot easily differentiate between these sugars and the added free sugars. A general rule of thumb is the first 5g per 100g of total sugars is lactose. The sugars to keep an eye on are the free sugars. 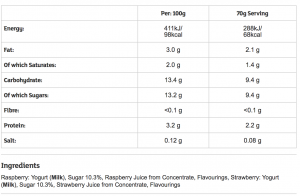 These are any sugars added to food/drink. These could be written as sugar, honey, syrup, agave, fruit juice for example. If you look at a yoghurt label and it is 8.5g total sugars then you can estimate about 5g is lactose and so 3.5g is added sugars. In this blog we are focusing on children. Children aged 4-6 should have no more than 19g free sugars a day and 7-10yrs no more than 24g free sugars a day. For children under 4 yrs there is no guideline figure, it’s just keeping added sugar low and avoiding it where possible. So in the instance of Full Fat Greek Yoghurt you can see that there are actually no added sugars in this. The sugar in it is all coming from the lactose and there is no sugar mentioned in the ingredients list confirming our thoughts. Compared it to this children’s yoghurt which definitely has added sugar. The label shows it as 13.2g total sugars per 100g, so thats around 8.2g added sugars (almost half the recommended amount for a child aged 4-7yrs). The label confirms this showing is has added sugar and the raspberry juice is also added sugar. So it definitely pays to look at the label when buying yoghurts. 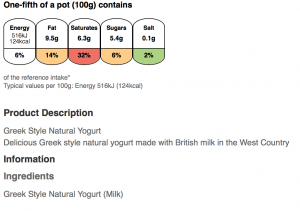 If you are comparing several yoghurts it is best to compare them per 100g, Scroll down to see a table with a range of common children’s yoghurt in that have the sugar content per 100g with a quick ranking done for you. Natural Yoghurt is also a winner. 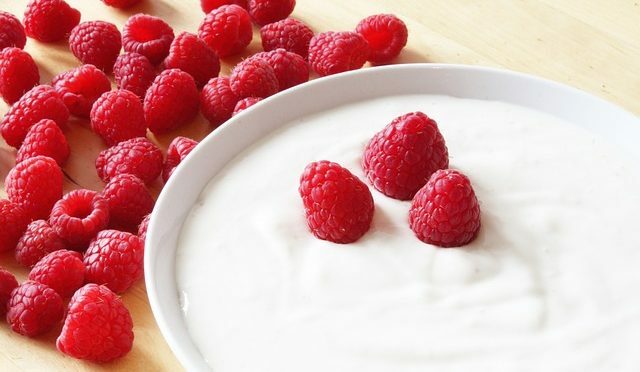 Skyr is a low sugar yoghurt due to the way it is made, even the flavoured ones are low in sugar so these are good options if you want a flavoured yoghurt. Anything with chocolate, added crunch, pureed fruit and most of the squeezy pouches. This of course does not meant you cannot ever give these to your children but it is about the balance. I’m not in favour of cutting foods out or saying a blanket no. However I would recommend keeping these yoghurts as occasional choices. Think about where else they get added sugars from in their diet? Also check the portion size as some of these products are very large portions and you could halve them, thus halving the sugar too. In our house we keep diferent yoghurts as an occasional change or we mix our yoghurt and add something sweeter to the Greek yoghurt.